Country Placemat -- $1.99 A Crochet pattern from Julie A Bolduc. 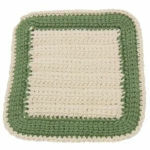 This placemat is fairly easy to make and starts off as 3 rows and then is worked in the round. You can coordinate the colors to match your kitchen or for any occasion.